Good god, this feels as good as beating the Yankees and winning the World Series. Man, I love every last one of these guys. And there you have it - the melted heart of a card-carrying cynic. Yesterday's ceremony was that great, that magical, that special, that absolutely perfect that an entire fandom was engulfed by only the sweetest of emotions this afternoon. And we devoured every sentimental second of it. Picking a best moment is like being asked to choose your favorite Seinfeld episode. There are too many classics to settle on just one. 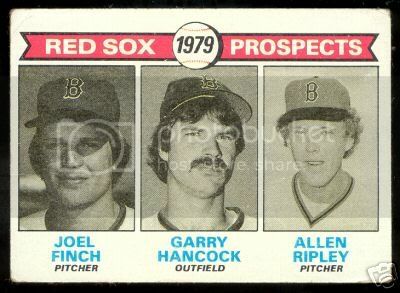 Was it the unannounced appearance of Dave Roberts, who popped out of the dugout and rocked Fenway to its rickety core? Was it the appropriate sendoff for Derek Lowe? Was it Yaz and Pesky, the "8" and the "6" symbolically side by side, raising the banner we weren't sure we'd ever see? The wounded troops delivering the rings and bringing tears to the jaded eyes of professional athletes? The return of Terry Francona, the beloved ailing manager, or the return of Tedy Bruschi, the beloved ailing linebacker? Bill Russell, back at Fenway for the first time in 40 years and signifying something so much more important? The revelation that football behemoth Richard Seymour throws like a 6-year old girl? It was so much to take in, to cherish, to absorb . . . it almost seemed surreal. But it was real. And it was spectacular. I wrote a few more things down on the notebook today, a few rants and a lot of raves. Here they are. I hope you enjoy them, and feel free to send me your recollections of the day. I'd love to hear them. Now if you'll excuse me, I'm going to go watch the tape again. And again. And then one more time, and again . 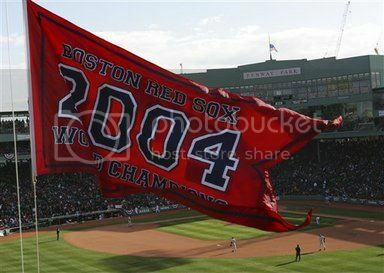 . .
~ The lowering of all the past Red Sox World Series banners onto the Green Monster - culminating with the 2004 World Champions banner that covered the entire wall - might have been the single most breathtaking moment in my lifetime as a fan. It was, to quote the great philosopher Billy Ocean, simply . . . awesome. They should leave that thing up there all season. I just want to stare at it. It can be like the baggie in the Metrodome. Except much cooler. 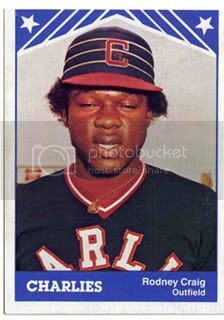 ~ I'm a native Mainah, too stoic to shed a tear, but let's just say my allergies really kicked in when Derek Lowe and Dave Roberts brought the old house down. And the strange thing is, I don't even have allergies. And I absolutely loved Lowe's simple explanation for coming back: "To get it right." Dammit, I do miss the Gidget. In good times and bad - and he had his share of both, no doubt - he always appreciated playing here. The only good thing about Lowe being gone is we had the chance to welcome him back so gratefully. ~ Three words for John Kruk and Harold Reynolds, the dueling twits on "Baseball Tonight" who ripped Lowe and Roberts for putting on a Sox jersey when they play for other teams: You. Don't. Understand. And three more words, made famous by Archie Bunker: Shut. Up. You. ~ Co-master of ceremonies Don Orsillo is so square, he must have to wear a shoebox for a hat. Dude makes Joe Castiglione look like 50 Cent. ~ Okay, there was one blemish on the day, and I'm sure you know what I'm taking about. "This one's for Teddy Ballgame . . ." The best thing I can say about Terry Cashman's "song" (term used loosely) is that it was hokey. In the spirit of the day, I'll refrain from saying the worst thing I can think of, but I must admit it was so amateurish I was wondering if he was winging it . . .
. . . hell, I'm pretty sure Brian Cashman could have put on a better show. If you missed it, WEEI spoofed here. This one actually intends to be funny. ~ If Dr. Charles Steinberg, the Sox P.R. guru who masterminded this production, intends to force Cashman's song down the Nation's throat like he did with Tessie, I can almost guarantee that an angry mob of Sox fans will string him up from the Coke bottles and leave him there until he promises to destroy every last recording. ~ Did you ever think there'd come a day where an appearance by Tedy Bruschi would deservedly overshadow Bobby Orr and Bill Russell? To see him in public for the first time since his discharge from the hospital was both heartwarming and devastating, and if you noticed his ever-so-slight limp, you know exactly what I mean. ~ Any explanation for why Tom Brady wasn't involved? Don't tell me he's still wearing that damn Yankees hat in private. ~ I'm not sure which is better, Johnny Pesky's unabashed, genuine and heartfelt emotion for . . . well, everything Red Sox, or the unabashed, genuine and heartfelt emotion Red Sox players so clearly have for him. While slowly making his way through the gauntlet of hugs, Pesky encountered former pitcher Curtis Leskanic, Pesky greeted him with a hearty, "Leskanic, you sunofab*tch!" If you don't love Johnny, your heart must be cast in charcoal. ~ By the way, did Leskanic join the Guardian Angels? Sweet beret, dude. ~ Another nice touch, having the former players wear the jersey styles of their generation. Flashing back after seeing Freddie Lynn with the old familiar No. 19 on his back, I halfway expected him to limp off midway through the ceremony with dislocated hangnail. I do wish they had done a better job telling us which alumni were in attendance. Was Pudge there, or wasn't he? And was that really Jody Reed? ~ I'll have to get Rob Neyer on the case, but I'm pretty sure Abe Alvarez has the best ratio of career-starts-to-World-Series-rings among any pitcher in major-league history. 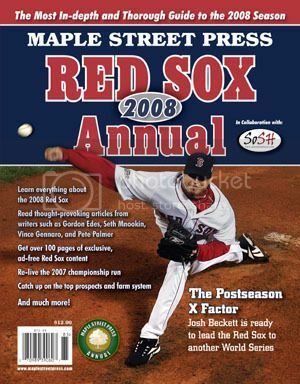 ~ Keith Foulke is just plain cool. The dude ambles. You can't fake ambling. I think John Wayne said that. And yes, I know I just qualified myself for the Tim McCarver I-Love-Mariano's-Gait Man-Crush Award for most inane fanboy smooching of a relief pitcher. I'll clear a place on my mantel. ~ Sox fans long ago became weary of being force-fed the Yankees' "class," but there is no other word to describe their conduct yesterday. My respect for them grew 26-fold, particularly for Joe Torre (for tipping his hat in tribute to Francona), Captain Jetes (for applauding when Johnny Pesky was introduced) and especially Mariano Rivera, who handled the Faithful's spontaneous, cascading cheers with pitch-perfect humor and grace. Plus, he gets bonus points for looking like he borrowed Matt Dillon's teeth from "There's Something About Mary." ~ The difference between Jeter smiling threw the boos and A-Rod pretending he doesn't hear them is the difference between four championships and zerozipnada. ~ Maybe if a juiced-up Jason Giambi didn't hit two homers in Game 7 of the 2003 ALCS, Sox fans would be more forgiving of him in his current situation. As it is: Steeeeerrr-roids! Steeeerrr-roids! ~ A moment of silence for the Pope, followed by a moment of silence for a relief pitcher who retired 40 years ago. Only in Boston. And I say that with bemused admiration and pride. ~ There's a little too much monster-truck rally SUNDAY!SUNDAY!SUNDAY! in Orsillo's voice, especially when he introduced Schilling. I agree with Globe colleague Bill Griffith - it's days like these when Sean McDonough is missed most. ~ I was snooping around the Sons of Sam Horn message board yesterday, so I had a pretty good idea which players got the best ovations - Papi, Varitek, Schilling, the usual postseason-hero posse. But in watching the festivities myself, it was cool (if not totally surprising) to see some unsung Sox get rousing ovations: Bill Mueller, Bronson Arroyo, Mike Timlin . . .
. . . and then there was Ramiro Mendoza. Crickets. Nothing but crickets. Chirp! ~ What's the worse crime according to the Kangaroo Court? Mendoza, a current Yankee property, wearing a Sox jersey to get his ring? Or David Wells, a current Red Sox, wishing he were a Yankee? ~ It seems appropriate that Orlando Cabrera hit a game-winning home run for the Angels last night. On a day where we wished last year's team well, it was nice to see him doing well. ~ So Terry Francona is No. 47. Huh. I had no idea. Until yesterday, I also had no idea he wore the ubiquitous red sweatshirt because he gets chills from his heart medicine. I do know it was reassuring to see the best manager in Red Sox history healthy and happy and cheered like no Sox manager has ever been cheered. His embrace with Bruschi was clearly more emotional than either man intended, another moment - this one unchoreographed - that tugged at the heartstrings and the tear ducts. ~ Does Wilford Brimley know Lynn Jones stole his mustache? ~ Orsillo introduced Mike Myers as "Lefty Mike Myers," the only player to get a positional designation before his name. His he really that much of a specialist? Does his wife call him that? ~ Tim Wakefield's an emotional guy, always has been in his 11 years here. The look on his face after giving up Aaron Boone's homer was the most devasted look I have ever seen on the face of a professional athlete. Which makes it even more impressive that he maintained his focus through the ceremony and went out and mowed down the Yankees in Boston's 8-1 victory. I can't imagine anyone being more professional than Knucksie. ~ The calendar says 2005, as it has for some time now. But for Sox fans, 2004 didn't end until today. With today serving as the final act of closure, last year is safely tucked away in the scrapbooks of our minds. We can now move on, or turn the page, as last year's World Series MVP likes to say. Now we can turn our attention to Renteria, and Mantei, and Clement, and the new Sox and the holdovers, and their chances of beating the Yankees. Again. A whole new season - well, a whole new season minus 7 games - awaits. Who knows what joys and sorrows it holds, but I do know this much. I wouldn't mind writing this column again next April. "Americano got the sleepy eye . . ."